Radiology (the taking of Xrays) is a common procedure in the veterinary field. It allows us to ‘see’ things that we wouldn’t normally be able to see. Over the years we have invested heavily in our radiology suite and now have a top quality digital system. This means no more holding up Xrays in front of a light screen and it gives us several advantages. 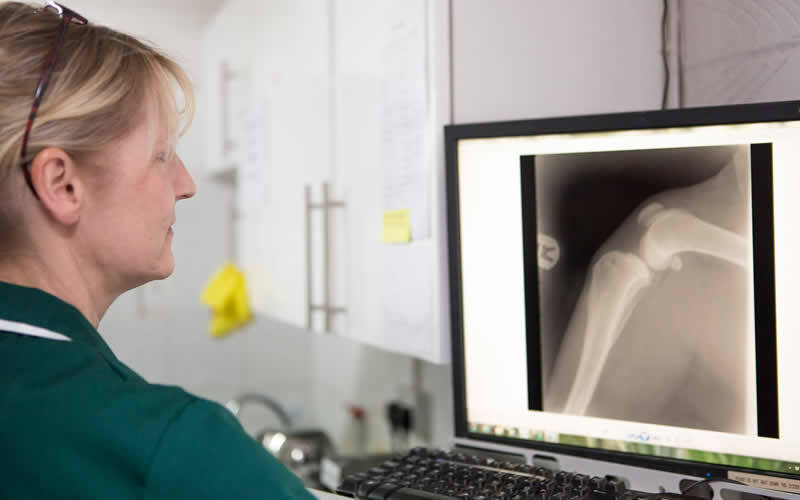 All our Xrays are instantly available on the screen in all consulting rooms and in the operating theatre. We can manipulate the images to lighten or darken, to magnify or to change contrast, to highlight the problem area. We can also e-mail them or put them on a CD and send them to a referral centre. Xrays are a useful entity but also are a form of radiation and as such we have stringent H&S rules to obey when we use them. So we must almost always sedate the patient to get a meaningful result and we are not permitted under any circumstances to allow the owner hold their pet while we are taking the xrays. We hope that owners understand these regulations and appreciate that there are no exceptions to them.